Boley Centers, Inc. received the GuideStar Nonprofit Profile Silver level logo, a leading symbol of transparency and accountability provided by GuideStar, the world’s largest source of information on nonprofits. The logo demonstrates Boley Centers’ deep commitment to nonprofit transparency and accountability. 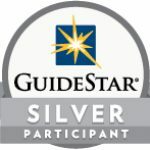 In order to be awarded the Silver logo, Boley Centers had to fill out every required field of our nonprofit profile on www.guidestar.org for that level of participation. We hope you will check us out and tell us what you think: https://www.guidestar.org/profile/59-1290089.